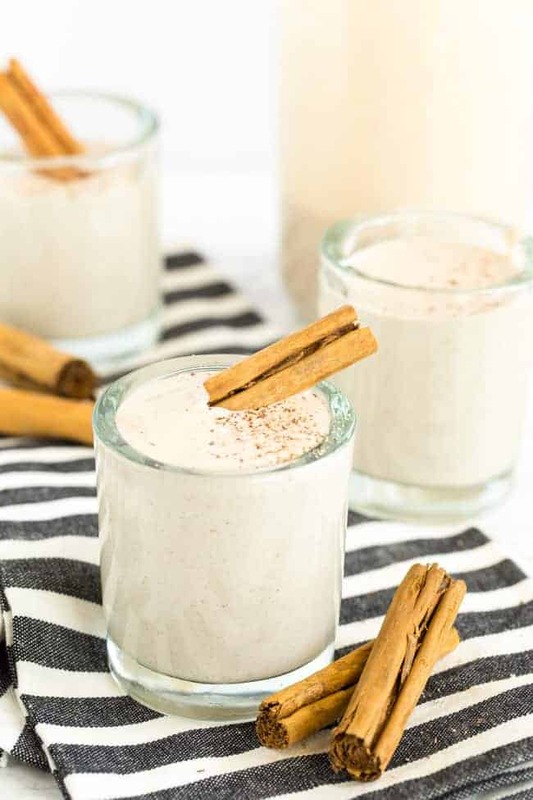 Vegan Eggnog gives you the flavors of a holiday favorite without the dairy and without the egg. You won’t be missing out on anything with this thick and creamy staple for all your holiday gatherings. 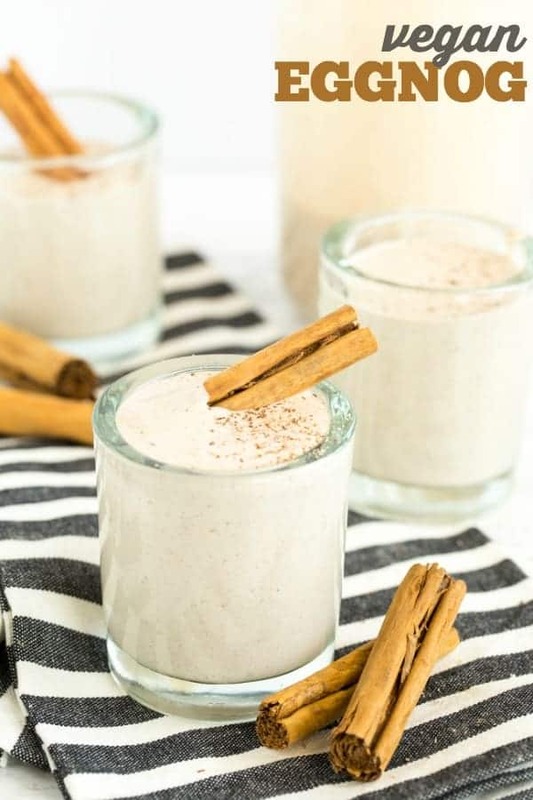 Vegan eggnog kinda sounds a little like eggnog blasphemy, right? I mean, it says it right there. 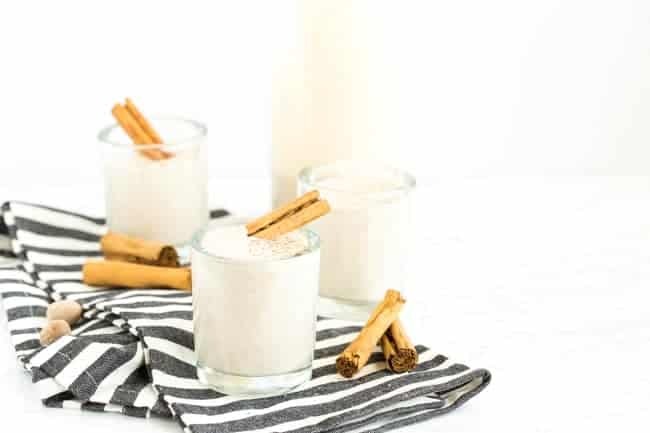 EGGnog. There must be eggs in order to get the full on nog, right? I don’t know about you, but the idea of eating or drinking raw eggs (or really any eggs for that matter) makes me a bit queasy. And I know I’m not alone in this feeling. Tons of people, vegans and non-vegans alike a weirded out by traditional eggnog. you know, research purposes for you guys! 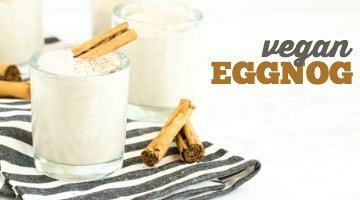 ‘Cause now that I’ve tried it, I want all those holiday flavors veganized and made into delicious plant-based treats that we can all enjoy… with no pesky raw eggs. Don’t forget about the thick creaminess that classic eggnog is known for. I mean, if it doesn’t completely coat the side of your cup (and your mouth… and your belly…) then you really can’t call it a nog. Agreed? 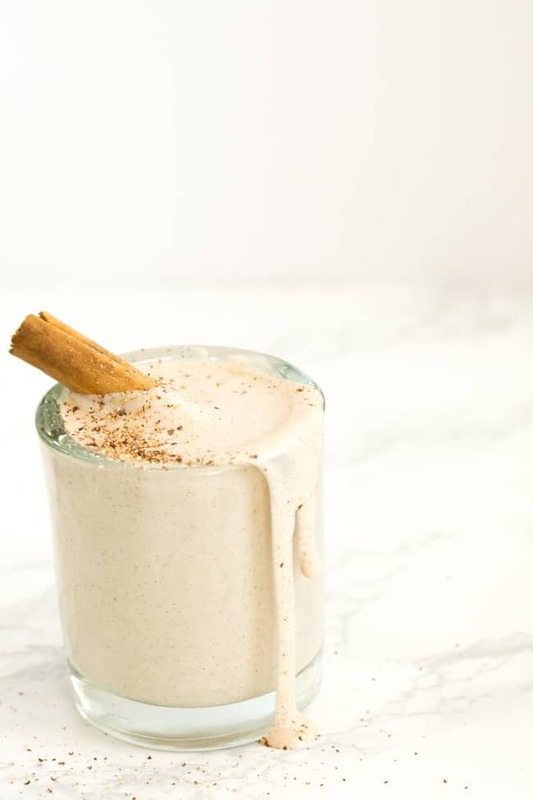 Well this cashew-based vegan eggnog does just that. It’s thick. It’s insanely creamy. And the flavor is just spot on goodness. I’m just thinking of all the times I’m going to be sipping on this nog, and I hope you now feel inspired (and thirsty!) to make your own. Honestly, it takes no time at all! 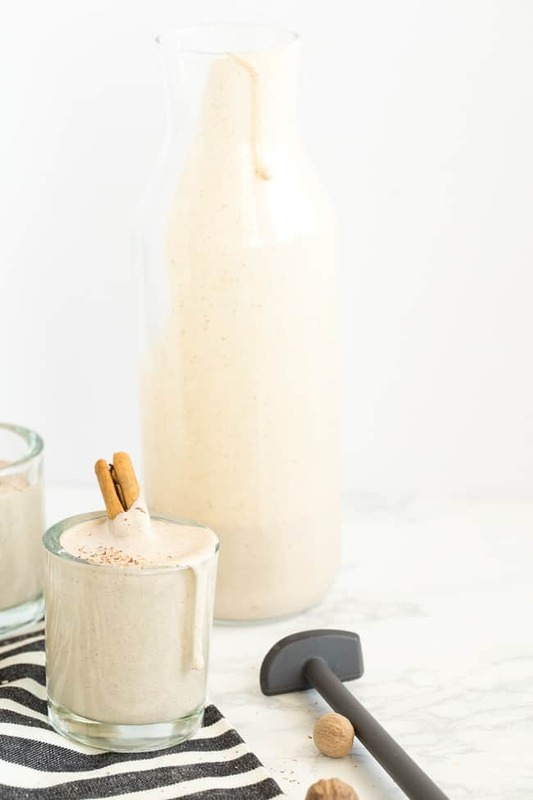 Especially because my friends at Vitamix thought vegan eggnog was the perfect way to show off their complete pulverizing skills during the holidays. Believe me, my high-speed blender totally went through the cashews like no other. No chunks of nuts in this nog. No need to strain or put through a sieve. Just dump it all in the blender, blend it up for a couple minutes, and pour right into a tall glass! And to make sure you don’t miss any of the thickness that sticks to the sides of the blender and the blades, be sure to put this blade scraper on your Christmas list (perfect stocking stuffer actually!). I did not want to leave any behind, and I didn’t with this little helper. I can imagine that it’ll be a huge help when I make up batches of nut butters and my thick smoothies every week. Here’s where you can find the scraper for yourself. Do you know someone who would be thrilled to get a brand new Vitamix underneath the tree this year? Head over here for the deals. 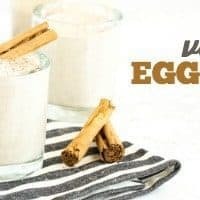 I cannot wait for you to try this vegan eggnog this holiday season. You will not be sorry! And if you’re a visual learner like me, don’t worry – I made a video for you! In a high speed blender, blend together soaked and softened cashews and coconut milk until completely smooth. Use the coconut water in the can as well as the cream. Add in remaining ingredients except for the rum, and blend until all combined. Taste for spice preference and make adjustments. Add in the rum if using and give it a quick last blend. Chill 1-2 hours before servings. You may want to give it one last blend before serving up, as ingredients could have settled or separated. Garnish with ground fresh nutmeg and cinnamon sticks.